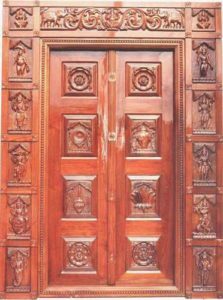 This door is manufactured in three different woods mainly teak, rose & jack which is said to be auspicious and wards away evil. 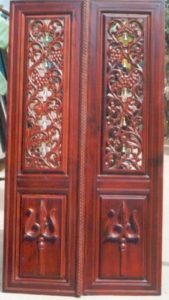 It has a carved wooden temple door of size 84” (height) X 64” (Width) x 12” (depth) with shutter size: 60” (Height) X 36” (width) X 3” (Thickness), frame size: 66” (Height) X 42” (Width) – Section: 6” X 3” and overlay size: 84” (height) X 60” (width) with –section: 9” X 6” This door is the sanctorum door of the temple, which houses the deity. 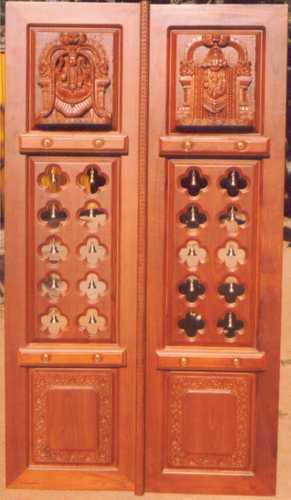 This door consists of Ashtalakshmi (eight lakshmi’s) based on the 8 aspects of prosperity. Adhilakshmi: Grantor of liberation, speaker and origin of the Vedas. Dhanyalakshmi: Provider of food and fruits of labour. Destroyer of undesirable things emerging from the milky ocean. Dhairya lakshmi: Grantor of swift results, removal of dread and provider of strength and refugee. Gajalakshmi: Destroyer of ill faith. Surrounded by chariot, elephant and horses who is worshiped by the trinity Brahma, Vishnu and Shiva. Vijayalakshmi: Worshipped for truth, victory and to achieve all our goals through wealth of prayer. Vidyalakshmi: Destroyer of sorrow, grantor of nine types of treasure, developer of knowledge and studded with variety of gems. Dhanalakshmi: It is worshiped on every new year day for happiness and prosperity for all year through. 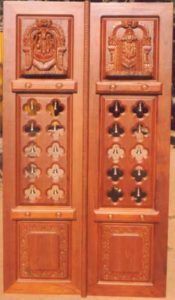 This carved rosewood double shutter temple door is of size 78″ (height) X 38″ (width) and standard thickness of 1½ “. 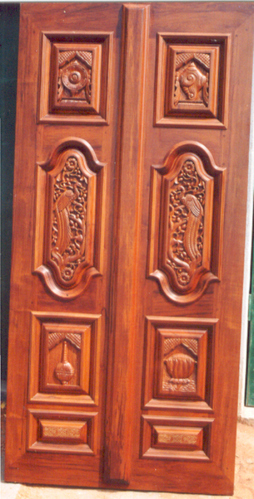 This temple Door has plain outer stiles and carved panels. The top two panels containing five bell arches with a design of a floral creeper around it. These panels are carved both on the front as well as the back, permitting one to see through and passage of light and ventilation as well. The bottom two panels consists of two Trishuls (trident of Lord Shiva) to protect the household from the evil eye. The fixture of bells is such that, when one opens the doors, the bells ring thereby awakening the deity to listen to our prayer. Varaha Avatar: The wild boar, which lifted mother earth when she was lost in the wide expanse of space. Narasimha Avatar: Half man and half lion, who slayed the mighty demon king Hiryankashyap. This king had got a boon from Brahma the creator that he would not be killed either by man or bees, by day nor night, neither inside nor outside. Vaman Avatar: A poor Brahmin boy who asked for three steps to set foot from the good demon king Bali Chakravarthy, symbolising the end of ego. Parashurama Avatar: The ascetic who vowed revenge against the mighty warrior kings for murdering his family. Rama Avatar: The most ideal man on earth who ever inhabited the earth. He destroyed the ten-headed demon king Ravana, symbolising the victory of good over the ten evils of humanity. Krishna Avatar: The naughty & playful cowherd king who gave a more human form to godliness. Buddha Avatar: He signifies the renunciation of earthly desires to attain nirvana. Kalki Avatar: The tenth & last avatar kalki is yet to come & save us from all the evil we face today. This temple door has the center half-open with bells and open space to ventilate the sanctorum. The top two panels consist of Balaji and Padmavathi and the bottom two have intricate floral carving. The significance of these god is prosperity and happiness and life long marital bliss. 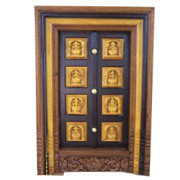 This floral carving temple door is available in size of 78″ (height) X 36″ (width) and standard thickness of 1½ “. 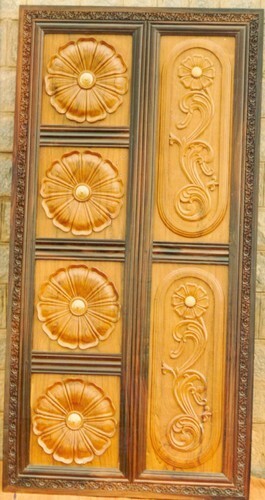 This door consists of six panels, top two panels with shanku and chakra. The bottom four panels contain swastik and kalashas. The central oval panel contains glass, which may be etched, stained or kept plain, depending on the customer’s requirement. The swastiks are perforated, thereby allowing ventilation for burnt incense and smoke. 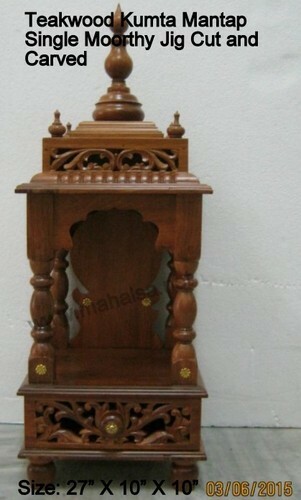 Made of teak wood they are available in size of 81″ (height) X 36″ (width) and standard thickness of 1½ “. 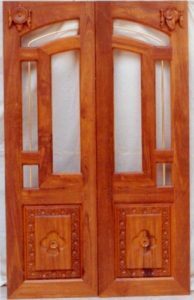 This carved double shutter teak wood temple door is of size 81″ (height) X 39″ (width) and standard thickness of 1½ “. 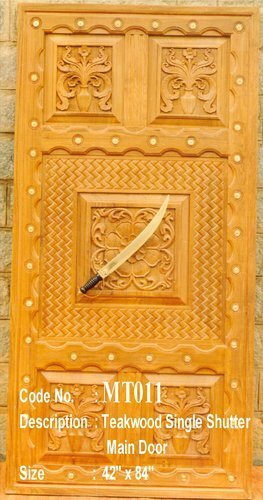 This door is a combination of ethnic and modern design and contains different material such as wood, brass and glass. The door design has a light inner arch a central glass panel to allow one to see the deity from outside. Shanku and chakra motifs are carved on the arch stile and light floral designs are carved on the bottom two panels. Open space is provided right round for ventilation and the brass rod is given for additional security.